Rising like a giant pringle from the Olympic Park construction site, the Velodrome is the first of the 2012 London Olympic venues to be completed. 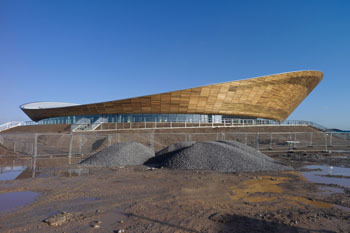 With its sweeping curved roof and beautiful cedar clad exterior the Velodrome is a stunning building. But what most of the athletes are excited about is the elegant wooden cycle track enclosed inside, the medals that will be won, and the records that might be broken, in the summer of 2012. The track is a symmetrical circuit, 250m long, made up of two long straights linked by two 180 degree turns. And like all velodromes the track is sloped, from around 12 degrees on the relatively flat straights up to 42 degrees at the steepest part of the banked turns. Seen from the centre or looking down into the turns from the spectator seats the banked turns seem perilously steep. But rather than tackling the slopes with caution cyclists use these steeply banked turns to create the high speeds necessary to fly around the track. The centripetal force can be a pulling force, like the force exerted when you swing a ball tied to the end of a string. But it can also be a pushing force, which comes from us instinctively leaning into a turn when riding a bike or running around a tight corner. 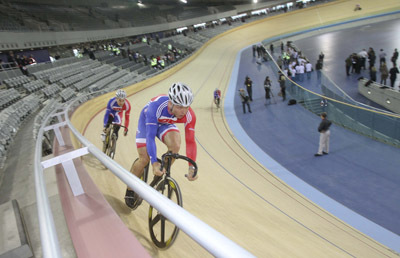 The London Velodrome's track is designed for maximum speed. When you are cycling in a straight line, with your bike perpendicular to the flat ground, the vertical force you experience due to gravity (your mass multiplied by the acceleration due to gravity , i.e. ) is counteracted by an equal upward force from the ground. When you lean into a turn the ground now pushes against you at an angle. 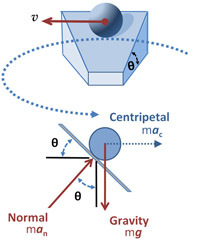 This angled force now contains a vertical component to counteract the force due to gravity, but also contains a horizontal component from the friction stopping your angled wheel from sliding. It is this horizontal push that provides the centripetal force that causes you to turn. Now the faster your speed or the tighter the turn, the more you have to lean, and you are limited to how far you can lean by the friction of the track. If you go too fast or turn too tightly you’ll lean so far over the wheel will skid out from beneath you and it’s going to get messy. This is why the track in the velodrome is tilted: as the cyclists go into the turn their bikes can stay perpendicular to the track rather than than relying on leaning over to get friction pull them around. The tilted track then pushes upward at an angle, and this force now contains a vertical component to counteract the force of gravity on the bike and rider, and a horizontal component that provides the centripetal force that pushes the cyclist around the turn. The forces acting in a banked turn. Image: Brews ohare. "In effect, on every banking a rider climbs a small hill on entry to the banking and descends the hill as he leaves the banking and enters the straight," Dave Cockram, the National Facilities Officer for British Cycling, told Engineering and Technology Magazine. "The optimum design is one that allows a rider to travel at the maximum speed with the minimum effort and the design of tracks has evolved over the years from two long flat straights with two banked circular turns into very complex geometry involving short straights with slopes of 10 degrees or more, transition curves with steadily increasing banking angles leading into circular curves with banking angles of around 45 degrees and transitions back into the straights of different slopes and radii." This is the speed at which the cyclist can move through the turn due to the geometry alone, without any help from the force of friction. The rated speed of a turn banked at 42 degrees around a curve of radius 25m is around 54km/h. But the same curve on a flat track would have a rated speed of zero — the only way you could follow that curve is to lean into the turn and rely on the friction of the track, and leaning at an angle of 42 degrees while moving at 54km/h is a risky business. The Velodrome track has been designed to produce world-record-beating times. But the geometry of speed has also inspired the curves of the sweeping roof and the cedar clad exterior. The external shape of the building allows for seating around the whole of the track, creating, according to Olympic cycling legend Chris Hoy, a "wall of noise" and a "gladiatorial atmosphere". Let the games begin. There is an excellent explanation of circular motion in athletics, including speed skating and cycling on physicsclassroom. You can go on a virtual tour of the new velodrome. Here's a nice article on the velodrome in The engineer. And you can read about the centripetal force and banked turns on Wikipedia.